Internal obsessions and compulsions are unseen but can be just as ritualistic and disruptive as visible ones. When most people think about obsessive-compulsive disorder (OCD), they probably imagine the most widely known forms of compulsive behavior, such as repeated hand washing or checking a door to make sure it is locked. However, there is a form of OCD, sometimes referred to as pure obsessional OCD (Pure O), where obsessions and compulsions take place internally. Since individuals with Pure O are often unaware they are being plagued by OCD and much of what they experience happens inside the mind, they often suffer in silence. Pure O is commonly misunderstood by others and, at times, misdiagnosed and mistreated by mental health professionals. As a result, an individual often concludes that he or she is internally flawed, evil, or psychotic, and the terror and isolation often experienced with Pure O is compounded. For example, one evening a new mother was placing her infant in her crib. Something in her mind told her to smother the baby with a pillow. Terror overcame the woman. She gazed at the baby girl, so delicate and helpless. The mother knew she was the one responsible for the girl’s safety, so she had an overwhelming urge to determine what the thought meant. The anxiety of doing this was painful, and she was plagued with incessant internal questions, such as “Does this thought mean that I could actually harm my child?” “Should I make sure I am never alone with the baby?” “I have been tired from staying up with the baby at night. Is it possible that I am angry with the her?” and “What makes me different than the mothers in the news who actually harm their children?” This line of mental analysis serves as the compulsion. The more time spent seeking certainty, the more confused and realistic the fear seems. The human brain naturally generates nonsensical and often bizarre thoughts, even for those without OCD. A study conducted by Rachman and de Silva (1978) found that healthy college students reported having thoughts with common OCD themes, such as violence, forbidden sexual acts, and urges to do inappropriate things in public. The difference is that when individuals without OCD experience ego-dystonic thoughts, meaning they are the opposite of an individual’s true nature, desires, values, and self-image, the brain responds differently. OCD is both genetic and learned. The structures that are impaired in the OCD brain create sensitivity to uncertainty and a decline in one’s ability to feel complete (Grayson, 2003). This leads to more value placed on incoming thoughts and relentless overresponding in the form of compulsions. Obsessions are intrusive and unwanted thoughts, images, impulses, or sensations. These mental intrusions are ego-dystonic. This contributes to the panic and internal resistance that accompanies such thoughts. • thoughts about normally unnoticed somatic functions, such as blinking, swallowing, or breathing. For example, a newly married husband and wife were sitting across the table from each other having breakfast. The husband glanced at his wife and a thought intruded: “She is not very pretty.” He got chills up his spine and tightened his grip on his coffee cup. He became preoccupied with repetitive doubts, such as “Why did I have that thought?” “Is she not pretty enough for me?” “Can I be happy with her?” “What if I have children with her and then have to leave my family?” “Maybe I shouldn’t have children with her.” “Am I a bad person for having this thought?” “It’s not like I am Brad Pitt.” On the way to work he noticed an attractive female, which triggered more anxiety and subsequent mental questions and answers. The label Pure O, in addition to the covert nature of mental compulsions, causes some clients to mistakenly believe they do not carry out their compulsions. With OCD, compulsions are always present, whether mental rituals or observable compulsions. Since individuals with Pure O fear the negative consequences of harmful, violent, or sexually inappropriate thoughts, they perform compulsive mental processes to neutralize fear. Mental compulsions function as a method of figuring out the meaning of thoughts and serve as a desperate attempt to reduce anxiety and distress many fear will never go away. For example, a nursing student is sitting in a classroom listening to a lecture. When the instructor says certain “bad” words, such as death, disease, metastasis, or cancer, she becomes very distressed. Her friend’s mother died of cancer a few months ago, and she has been worrying about the health of her family ever since. She begins to develop a process to protect her family from harm. Every time she hears an uncomfortable word, she recalls an image of her mother’s friend on one side of a very high wall and her family safely on the other side. At times, an image of one of her family members ends up on the wrong side of the wall. She then closes her eyes and counts silently—one number to represent each loved one. If she makes a mistake, she must start again, and before she knows it, the class is over. This becomes very distracting, and her grades drop dramatically. • Mental reassurance: This is someone’s attempt to provide reassurance that feared consequences will not occur or that thoughts do not mean anything. A person may examine whether having thoughts of harming others means he or she is evil or bad, even when the person does not fear that he or she will act on the thought. • Mental review: An individual will review his or her memory to gain certainty about events that already occurred. Clients may think about a time when they were holding a child and have a “memory” about touching the child inappropriately. The more an individual attempts to gain certainty about the memory, the more memory distrust emerges. • Compulsive prayer: This is when someone mentally recites special words or prayers to neutralize unwanted thoughts. For example, when a woman was saying her bedtime prayers, the word “Satan” could be heard during the prayers. She continued praying until the intrusion was gone. • Wishing: Someone may spend a great deal of time wishing his or her thoughts would cease and fantasizing about how life could be without obsessions (Grayson). Wishing is counterproductive and functions the same way as other compulsions, magnifying the importance of thoughts. • Overt compulsions: In addition to mental compulsions, individuals with Pure O also engage in observable compulsions, such as reassurance seeking, avoidance, and repeating behaviors, to neutralize thoughts. For example, if a client has a “bad” thought when starting his car, he may restart the car while matching it to a “good” thought. Most clients enter treatment with the goal of stopping their obsessions. However, their attempt to get rid of unwanted thoughts is the problem. A more reasonable goal is to change the individual’s relationship with and reaction to intrusive thoughts. Acceptance and commitment therapy (ACT) is a type of mindfulness-based cognitive therapy that teaches clients to regard “internal private experiences” as normal rather than viewing them as problems that need to be fixed. Uncomfortable thoughts, feelings, images, urges, and sensations are all part of the human experience. If we view them as problems, they become problematic. ACT has various techniques to help clients use mindfulness to observe their thoughts rather attaching to and becoming overwhelmed by them. Russ Harris, in The Happiness Trap: How to Stop Struggling and Start Living, discussed a skill called cognitive defusion, which helps an individual create room for intrusive thoughts. A client thinks, “I am a bad person.” To practice defusion, you would restate the thought: “I just had a thought that I am a bad person” or go a step further and say, “I just noticed I had a thought that I am a bad person.” This allows clients to occupy the same space with their thoughts but from a different vantage point. Instead of being crunched in a small closet with their thoughts, they are now in a gymnasium with them. ACT also stresses showing irreverence to internal private experiences and instead choosing to live life based on one’s values. Someone may value building relationships with others. If this person is living in accordance with his values, this person will decide to go to his nephew’s birthday party even though he may have harming thoughts that appear when he sees children. Living life despite obsessions takes the power away from them. Helping clients identify their distorted thinking patterns can assist in the treatment of Pure O. Cognitive restructuring that involves recognizing and reframing cognitive distortions can help clients make logical choices about how to respond to their thoughts. When using traditional cognitive therapy, encouraging clients to repeatedly convince themselves of the irrationality or absurdity of their thoughts mimics the way they engage in mental compulsions. Instead, teach clients to use alternative thoughts that encourage them to sit with uncertainty, accept thoughts and feelings, and recognize that exposure is the best option. Exposure and response prevention (ERP) is a type of behavioral therapy that involves exposure to an obsession paired with prevention of the neutralizing ritual using a structured, hierarchical method. Imaginal exposure is a component of ERP when using it to treat Pure O. A client may be asked to conjure a feared image and hold it in his mind for a period of time. Writing or saying words or phrases that elicit anxiety is another method. Some words that could be related to harm include “blood,” “murder,” “slash,” “kill,” or “dismember.” The slow progression ends up with clients writing scripts about harming someone in more detail. These scripts can be recorded and listened to periodically throughout the day. Clients are also asked to do physical exposures such as holding a knife or watching a murder-themed movie. The purpose of exposure therapy should never be reassurance or safety but to become accustomed to moving forward in life in the face of inevitable uncertainty (Grayson). The goal of ERP is to consistently increase anxiety levels and attempt to keep them high, eventually failing because of the habituation process. The natural by-product of exposure is habituation. An individual will eventually decondition the anxiety that has been paired to his obsessions. When thoughts do arise, the relationship with them is one of openness and acceptance. Intrusive thoughts may even come less frequently after one has learned to live with them. When encountering a mountain lion on a hike, everything inside you urges you to run but knowing that will only encourage the lion to chase you, you logically decide against that response to stay alive. Clients can learn to use logic to respond to their OCD in a new way. The clients who improve are the ones who realize that the thoughts don’t actually have to go away. With treatment, clients can expect to take their lives back from their OCD and start living again. 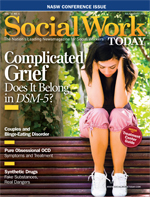 — Stacey Kuhl Wochner, LCSW, provides psychotherapy for individuals and groups with obsessive-compulsive disorder and obsessive-compulsive spectrum disorders at the OCD Center of Los Angeles (www.ocdla.com). Mandated reporters are required by law to report any risk of imminent harm to vulnerable populations, such as children, elders, and people with disabilities. In addition, many states have duty to warn laws that require mental health professionals to warn potential victims if the professional has reasonable grounds to suspect that a client may be in danger of personal harm or harming others. It is possible for mandated reporters to misinterpret their responsibilities when hearing clients describe their harm-laden obsessive-compulsive thoughts. These obsessions often have themes of pedophilia, harming children or elders, and even suicide. There is an important distinction between obsessive-compulsive thoughts and the thoughts, plans, and desires that actually put people in harm’s way. Clients who experience horrific thoughts and images are no more likely to act on these thoughts than the general population. They are not psychotic, delusional, or experiencing command hallucinations instructing them to do harm. They are experiencing thoughts that are ego-dystonic, meaning they are distressing, unacceptable, and inconsistent with their identity and how they choose to behave. The theme that can be particularly confusing is when a client is discussing unwanted thoughts about suicide. A client with suicide-themed obsessions does not want to kill himself and actually avoids knives, pills, or being alone for fear that he or she will act on the obsession. Clients often avoid sharing the themes of their obsessions or avoid therapy altogether if they are afraid their thoughts will be misinterpreted and reported to protective services or law enforcement agencies. It is important to conduct a thorough assessment to determine whether an individual’s thoughts are ego-dystonic or ego-syntonic, paying special attention to the ways in which they respond behaviorally to the thoughts. Grayson, J. (2003). Freedom from obsessive-compulsive disorder: A personalized recovery program for living with uncertainty. New York: Berkley Publishing Group. Rachman, S. & de Silva, P. (1978). Abnormal and normal obsessions. Behavior Research and Therapy, 16, 233-248.